CROSBY is the world’s most reputed name when it comes to lifting tackles. All Crosby products are load rated, fatigue rated, quenched & tempered, type approved & rfid equipped. We specialize in offering our clients high grade shackles (D type) double hole that is used in tractor parts. We manufacture these shackles using high grade steel that make them highly functional and durable. These shackles are offered in various sizes and shapes to cater to the varied requirements of the clients. The shackle produced at our manufacturing unit is widely accepted and have earned great accolades from all across the world. Besides the Shackle we are also offering Clevis which are used in installing heavy equipment and machines and is also used for fixing balustrade, barriers, roller shutters & fire doors and switchgear. Size: 1 TON TO 55 TON CAP. 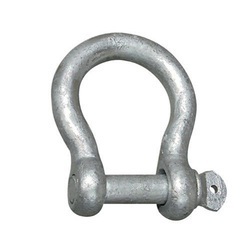 We are one of the trusted and reliable suppliers of a vast range of Chain Joining Shackle that is known for its durable finish, high tensile strength and corrosion & chemical resistance. 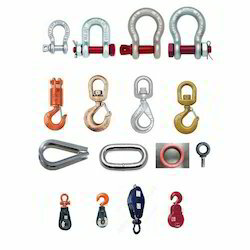 Our offered range finds wide applications in Lifting Accessories, Construction Companies, Finished Machinery Manufacturers, Rigging Hardware Companies, Marine Industries and Heavy Equipment Manufacturers.